Motorcycle responders work in busy, built-up areas where it can be difficult for an ambulance or a car to get through. They are able to reach patients quickly and start to give life-saving treatment while an ambulance is on the way. All single responders have been fully trained to work on their own. Our motorcycles carry the same life-saving equipment as ambulances, including a defibrillator—a machine used to restart a patient’s heart when they have had a cardiac arrest. 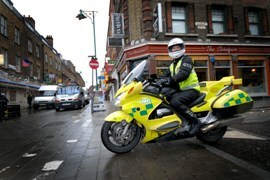 We currently have motorcycle responders in central London, Hackney, Tower Hamlets and the City of London.